Well, I had a bit of a break as I was out of town. I’m just now catching up. 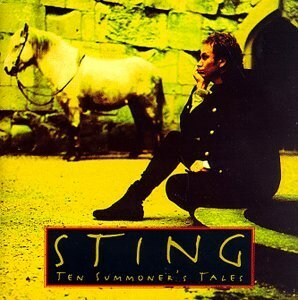 Reflecting on Ten Summoner’s Tales , it’s an easy album to reminisce about. The songs themselves are all reminiscent in their own ways, evoking images and characters that are memorable. Perhaps in homage to the summoner’s tale in Chaucer’s seminal work, Sting adopts the guise of a balladeer, roaming the countryside and recalling the humorous, historical, wistful, and eerie in equal measure. His accompaniment is lighthearted for the most part, and can shift to romantic or mysterious and back again without much effort. “Love Is Stronger Than Justice (The Munificent Seven)” is a parable about greed transformed into lust, which eventually leads to fratricide. The twangy backing leads to a jovial feel with steel guitars mixed in with a gospel like organ, and the melody hits just enough sour notes to reinforce the duplicitous nature of the narrative. “Heavy Cloud No Rain” draws on the same playfulness and shows how the problems of the rich (at least in the French Revolution) are pretty much the same as that of the farmer when you’re waiting on nature to deliver some help. “Fields of Gold” comes across as somewhat sentimental and sappy, but as my review of 90s music continues, that is pretty much par for the course. Given my obsession with fantasy novels at age 11, the images of farm maidens and long, meaningful exchanged glances were probably well received at the time. Listening now, it is more than a bit cloying, and while the Northumbrian smallpipes (thanks Wikipedia) definitely establish that fantasy mood of the English countryside, my 30-year-old self thinks that they probably could have been reigned in a bit. Upbeat, poppy ballads like “If I Ever Lose My Faith In You,” “She’s Too Good For Me,” and [shudder] yet another “days of the week” love ballad, “Seven Days,” fit right in with the rest of Sting’s solo cannon. They are somewhat saccharine, occasionally annoying, and generally agreeable as background music. Relax, have a cigar, make yourself at home. Hell is full of high court judges, failed saints. We’ve got Cardinals, Archbishops, barristers, certified accountants, music critics, they’re all here. You’re not alone. You’re never alone, not here you’re not. [maniacal laughter] OK break’s over. The references seem somewhat personal (especially “music critics”) and I’m not sure if Sting had a score to settle. I’m not sure who delivers the monologue, but it sounds like it could be the artist himself donning a strong cockney accent. The whole concept of “you’re not alone” seems to be cajoling by the Devil for the protagonist to acquiesce to his urges, but it also seems to contain some additional meaning due to it’s emphasis. That song ushers in the three more somber tracks that actually give the album some character. “It’s Probably Me” has a bluesy, city vibe with some fine saxophone work to drive home the grittiness of the setting. It reminded me strongly of James’ “Don’t Wait That Long.” Sadly, it was somewhat ruined when I learned that the song was written with Eric Clapton (who, if he plays guitar on this track is utterly forgettable) for Lethal Weapon 3 and builds on “motifs” from the Lethal Weapon song “The Weapon” (some less generous folks might say it “steals” those “motifs” and “recycles” them). Sometimes, it seems, it’s better not to dig for these things. “Shape Of My Heart” has a Spanish-style guitar played by the song’s co-writer and longtime Sting guitarist, Dominic Miller. It is a meditative piece that tells the story of a lovelorn, world-weary gambler searching for solace in the patters of a deck of cards that might revive his chances (and desire) for love. You wouldn’t typically think of a harmonica solo working well in this vein, but the whole thing kind of evokes a gambling man with a passionate, Wild West spirit subdued by the repetitiveness of a sterile Las Vegas casino floor. That same harmonica opens “Something The Boy Said,” which flashes to a band of travelers in a middle-Earth-like setting marching towards their impeding death. I still can’t really make heads or tales of the narrative in the lyrics. The ominous prophecy of the titular “boy” seemed to be better echoed by the composition of the song when I was younger, but it has a very easy-listening vibe to it as I relisten that doesn’t match well with the spirit the song is trying to capture. There are somewhat cheesy sounding synth vibraphones, and the shift from minor back to major key in the bridge before the last refrain, while a technically sound maneuver, dispels the mood of the previous verse that describes “burning corpses” and the feast of the “carrion crow” that the narrator is too petrified to look back upon as he flees the battle (or whatever it was); death metal this song is not. “Epilogue (Nothing ‘Bout Me)” is a kitschy comment on privacy in the pre-Facebook age that sounds absurd. It evokes the stupidity of tracks like “Englishman in New York” that embody the worst of Sting in my mind. I have to say I’m not a huge fan of his solo career in the first place (I much prefer The Police), but there are some songs that are insufferable, and this one comes pretty close to fitting the bill. To this day I am hard pressed to explain why exactly I liked this album at age 11. I suppose it has something to do with the “right place, right time” theory of music, but a relisten reveals that the tracks are still slick, somewhat appealing, and even (in some cases) lyrically potent. As a concept album, it is a failure. Sting, though a master pop song craftsman, only achieves the country balladeer feel in roughly half the tracks. The other half just come across as generic, serviceable cannon entries. Likewise, the somber turn in the album’s second half no longer establishes the requisite mood for me years later due to some of the more hammy musical tricks. In a stripped down version, the lyrics and fundamental composition of the tracks might shine more brightly and give the otherwise well-composed tracks on Ten Summoner’s Tales some new life.